HIGHLIGHTS: This is a short hike in Big Canoe that descends 0.4 miles from the trailhead to a small and two-tiered waterfall known as Upper Falls. 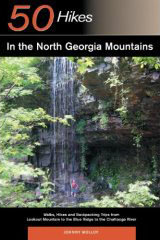 The hike follows an old jeep trail to the falls which carve a deep cut out of exposed rock. There are two small pools in the waterfall and picnic tables and even a trash receptacle at the base. The hike back out is entirely uphill but it’s suitable for small children.